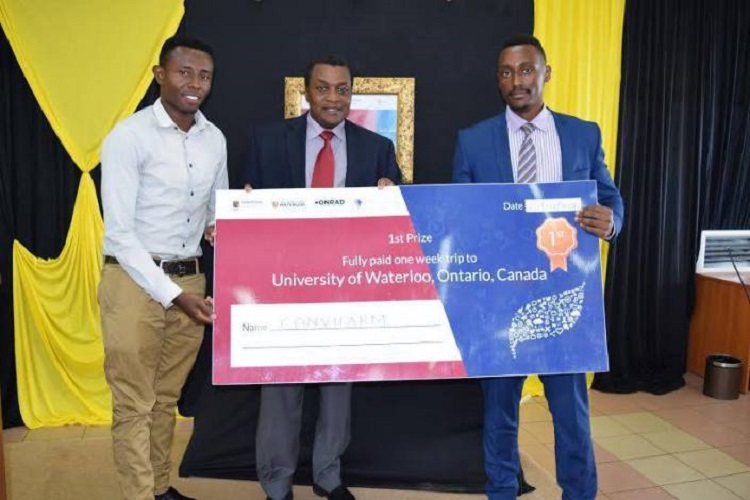 Agriculture information mobile app ConviFarm was last week named the winner of the @iLabAfrica-Waterloo University Agribusiness Mobile Tech Challenge in Nairobi, Kenya, winning a two-week trip to Ontario, Canada, for training and incubation. @iLabAfrica, Strathmore University’s technology research and innovations centre, partnered with the University of Waterloo in Canada to launch the agricultural mobile applications competition, seeking to generate applications with high impact potential for Africa’s agriculture sector. Norman Muga of Strathmore University and Mburu Njunge of Kenyatta University emerged the winners of the competition for Convifarm, a mobile app created to bring convenience to farmers through mobile agriculture, by accessing information and services across diverse enterprises along the agricultural value chain. They will now travel to Canada, while second prize – a scholarship for the 6-month Strathmore Entrepreneurship Development Programme – went to Greenup_africa for its app connecting farmers to other farmers and buyers, cutting out middlemen and brokers. Kenya’s Ministry of Information and Communication principal secretary Dr Victor Kyalo, who presented the prizes, commended @iLabAfrica for delivering global partnerships that deepen technology adoption and local innovation. @iLabAfrica director Dr Joseph Sevilla said agriculture was the mainstay of at least 80 per cent of the Kenyan population, hence the choice of the sector as the subject of the competition. “The University of Waterloo is rich on entrepreneurship, it is the one reason we were happy to join hands with them. While we chose agriculture because it is one of the businesses that provides a large revenue to the country,” he said.